While the British establishment and media fawn over the visit of President Obama (apparently it’s only back home he can’t walk on water), I choose to celebrate the life of another renowned American, Bob Dylan who was 70 yesterday. Genius is such an overused word but in Dylan’s case it’s justified. A library of books has been written about the man and still he remains an enigma. So the best I can do is tell you why I’ll be your baby tonight is my favourite composition. Across the unique breadth of his output, I've always had a soft spot for Dylan’s love songs. Not just the ones addressed to women (Lay, lady, lay) and his children (Forever young, probably Jakob Dylan), but some of his born-again offerings (Gotta serve somebody). 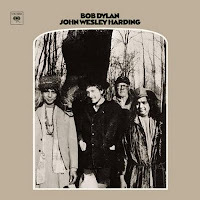 But his final track on the 1967 John Wesley Harding album I’ll be your baby tonight tops the lot. It’s unambiguously about the prospect of a one night stand. But unlike some other Dylan ‘love’ songs it lacks the urgency and hurt that can border on misogyny. The song reeks of lust, moon/spoon humour, and an altogether, if fleeting, good time. No wonder it left its mark on my 22-year-old soul. Close your eyes, close the door. You don't have to worry any more. Shut the light, shut the shade, you don't have to be afraid. Here he is the passive partner. None of this “be my little baby” approach; I’ll be your baby tonight. And I’m already so chilled out – and probably horizontal – that you’ve got to fix things in our room before joining me. Well, that mockingbird's gonna sail away, we're gonna forget it. But we're gonna let it, you won't regret it. Just for the next few hours there’s just you and me. Kick your shoes off, do not fear, bring that bottle over here. I can’t find a link to the song sung by Dylan himself. Among excellent cover versions – I like this one particularly by Norah Jones. The greatest troubadour in the English language of the 20 th and early 21 st centuries. He has brought poetry to the masses. A poetry of swirling images using a variety of musical forms as a vehicle for his acute lyrics. A philosopher, with poignant messages galore. An acute observer of the abused and poor of America. Master of the musical anecdotal story. Historian, prophet, America's conscience. True teller of the ironies and contradictions of life, of falls from grace, of drug addicts and beggars, and The Masters of War. The lyrics of his songs spoke for a whole generation and stimulated that generation to begin thinking once again and to question the social and political environment which the Establishment had conditioned the Nation[s] to take for granted. His works helped to take America out of the war in Vietnam. A huge body of work spanning over 50 years. He is still with us but already his influence and legacy is truly awesome !! Happy Birthday Robert Zimmerman. and the last Dylan album you bought/concert you saw/radio show you heard/book you bought was..? To "Anonymous" of 27/05/2011 12:08 : What is the point that you are trying to make? 'Forever Young' [1974 version] might just refer to Neil Young; he and Dylan go back a long way together. Bob Dylan, Neil Young and Eric Clapton. "I want you", a single released alongside the "Blonde on Blonde" LP, is also a superb Dylan love song, with great lyrics.